Rwandan President Paul Kagame announced last week that he will seek a third term in office in 2017, following a December referendum allowing him to serve beyond the constitution’s previous two-term limit. 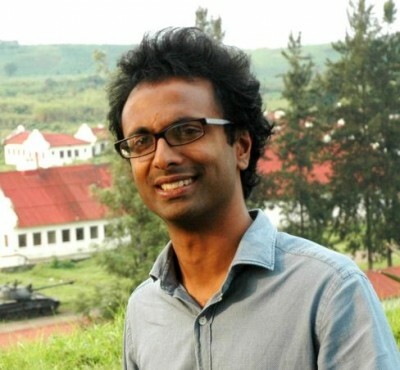 World Policy Journal spoke with award-winning journalist Anjan Sundaram [pictured left] to discuss Kagame’s repressive regime and the silencing of independent journalists in the country. Sundaram’s new book, Bad News: Last Journalists in a Dictatorship, will be released on Tuesday, Jan. 12. WORLD POLICY JOURNAL: What did you consider your role or your responsibility to be as a foreign journalist working in Rwanda, and how did the restrictions on the local journalists affect this? ANJAN SUNDARAM: Local journalists and I worked in very different positions. The local journalists were fighting for their own freedom, and they were taking greater risks than I was because their lives were in danger and their families were in danger. They were hoping that their children could live in a better and freer Rwanda. My own experience was rather different. I had sympathy for my students, so when my students were in trouble I wanted to help them. Of course I was in less danger than they were, but that also meant that I could take greater risks. So during most of my time in Rwanda I did not publish press articles for fear that I would be thrown out of the country and would not be able to help my colleagues and my students. And that was the biggest trade-off; I had to keep silent for a long time. This book is the result of the information and interviews and experiences I gathered during many years of silence in Rwanda, collecting information patiently trying to help [my journalists] as best as I could. WPJ: You draw parallels between Rwanda’s current political dynamics and those that existed leading up to the genocide in 1994, particularly in terms of the enforcement of a single state-directed narrative and the silencing of alternative voices. What does this suggest about the degree of change that’s happened in the country since the genocide? AS: On the surface it looks like there’s been a lot of change and a great deal of progress. There’s a lot of calm in Rwanda, it seems stable, and it’s held up by many foreign donors as the island of stability in a troubled region. But the reality is that the same structures that were in place prior to and during the genocide are still in place today, and they’re being reinforced. And this obviously does not augur well for the Rwandan people. The level of control is extreme—there is no free press, there are no institutions to speak of. Last week President Kagame announced he would run for a third term, violating previous promises to respect what had been a two-term limit in the constitution. Now he’s saying the country needs him and people have asked him to stay on, like many dictators do. But really Rwanda today is a structurally unstable place and there’s very little likelihood that there’ll be a transfer of power without violence. WPJ: Kagame played a prominent role at the time of the genocide, and he’s still the main figure in the country now. So how much of the problem is tied directly to him, and how much is just how the system operates? AS: It’s all tied directly to him, he’s the central power in Rwanda and his power is almost absolute, and even his supporters—those who claim he is somewhat democratic and is doing good for Rwanda—would admit that his power is almost absolute. He’s responsible for all the structures that are in place today in Rwanda. And he is directly responsible for the continuation of the system of control that was used to conduct the genocide. He says he is now using that system, or a similar system, for good, but the risk is always that he might make a bad decision, or leadership in Rwanda might change and that the system in place is incredibly powerful and incredibly catastrophic, as we saw during the genocide in 1994. It’s all very well for Kagame to say he’s a good person and is leading the country with good intentions. The reality is that there are almost no checks and balances, and his government and he are capable of doing a great deal of harm, which goes unreported in Rwanda. WPJ: Do you think Rwandan society has recovered to any extent from the genocide, to whatever degree that’s even possible, even if the state might not have not changed much at its core? AS: I think there’s very little sense among Rwandans of the existence of individuals with rights, with possibilities. There’s a small elite in the country who feel the sense of possibility, but for the majority they are under the control of the state and their lives are highly restricted. I think there’s been a natural healing process in the last 20 years coming to terms with what’s happened and understanding why that’s happened, and there is a genuine desire among Rwandans that it does not happen again. I think that’s at the root of the obedience toward the current government—[the people] are worried that were they to oppose the government, or were there to be a rebellion, there would be renewed violence. They’re so traumatized by the experience of extreme violence that they accept a great deal of control and repression from the Rwandan state without fighting back or pushing back. The underlying tension that caused the genocide has not been addressed. Kagame’s solution was to say that ethnicity was an invention of the Belgian colonial powers that ruled Rwanda for many decades. And so there’s been a de facto ban on speaking about ethnicity in Rwanda. That unfortunately has not helped reconcile many of the tensions that led to the genocide, and in private Hutus and Tutsis still speak extremely violently and aggressively about the others’ ethnicity. So I would not say there has been a great deal of true reconciliation in Rwanda. WPJ: Another issue that you bring up in the book is the role of foreign embassies in supporting the Rwandan government and its repression by providing large sums of aid. What do you think foreign governments should be doing about the current situation in Rwanda, and why are they not doing it? AS: I think foreign governments are very well aware of the repression in Rwanda, I think there’s a perverse situation right now in which foreign governments are hard pressed to find aid that delivers results worldwide. And Rwanda is one of the few countries where aid plans are actually executed according to plan, largely because of the repressive government. For aid agencies this is a paradise—they come in with their plans and their plans are executed almost as they’ve been drawn up. It’s led to a perverse situation where aid agencies and foreign governments benefit from the repression, so they have no interest in disrupting it. Foreign aid officials are getting promotions and receiving plaudits for excellent management of aid programs, so the repression is actually serving foreign governments’ interests. The real question is why is the world financing a dictatorship. In the case of an emergency there is no excuse for not intervening. But Rwanda is not in emergency today. The aid that is being provided is for long-term development, and most of it is being channeled through the Rwandan government or for government-supported projects. Foreign donors providing this aid could influence the Rwandan government a great deal but choose not to. Aid that is sent directly to NGOs and independent organizations on the ground would not reinforce the government’s repressive mechanisms in the same way. That already would always be a huge improvement in the way that aid is managed. I think donors or foreign governments have not even begun to assess that they might be doing harm and bolstering the Rwandan government. If there was a way to support the Rwandan people who need support—by alleviating poverty and improving health—without directly going through the Rwandan government, that might be a far more effective and less fraught way of providing foreign aid. WPJ: The period that the book covers ends in late 2013. Has the state of independent journalism changed at all since that time? AS: Not at all, there is no free press in the country today. When the Rwandan government held a referendum in the country to decide whether the two-term limit on presidents should be removed, apparently only 10 Rwandans in a country of more than 10 million opposed his run for a third term. This speaks volumes about how little freedom of speech there is in Rwanda, how few people actually dare to speak up. There are good journalists in Rwanda who know how journalism should be practiced, but unfortunately they’re all too scared. They’ve seen too many of their colleagues murdered, imprisoned, tortured, or having to flee the country to save their lives. The Rwandan government does not understand the benefits that free press would provide to the country’s development. It doesn’t understand how free press needs certain protection and that a free press would criticize the government, and that this is a good thing. It also makes the argument that free press—particularly radio broadcasts—contributed to the genocide in 1994. This is a false argument because while the genocide was happening, any media that spoke up against the killing was shut down. There was only a single voice in the country, much as there is now. During the genocide, that single voice was advocating genocide, and people who opposed it were killed or imprisoned. There’s a very similar situation in Rwanda today, where the government’s voice is the only voice in the country, and journalists know that were they to oppose that voice, the consequences would be dire. WPJ: Based on your description of the narrative that’s carefully crafted by President Kagame’s regime, your book represents a disruption to the way that the country is typically portrayed, both in domestic media in Rwanda and in international media. What do you think the response in Rwanda—and particularly the government’s response—will be? AS: Historically the government has allowed English press to exist in Rwanda, even that which is critical of the government, because English is only spoken by a tiny minority of elite with very little incentive to disrupt the current power structure. I know that my book is being read in Rwanda because I am receiving emails from people who have somehow obtained copies. Because of Kagame’s announcement last week that he will stand for a third term, this is a particularly sensitive time in Rwanda, and the book is disruptive in that sense. I thought there was almost an obligation to write about what I experienced, even if it’s merely to put on the record what happened. Most of the repression is forgotten. Most of the journalists who have been killed or exiled are simply forgotten. There are many great people who stood up to the Rwandan government, who saw the increasing repression, and knew that this was not the direction in which the country should be heading, particularly in a country with a history of genocide. They knew that the risk was great and they were brave enough to stand up to the government, and they suffered for it. And now they’re mostly forgotten. I wanted to correct that in some way, and record as much as I could of their stories.